About twenty years ago I climbed Carrauntoohill, Ireland’s highest mountain, at night in June around the time of the Summer Solstice. It was a beautiful calm night, there was a full Moon, and sitting on the summit as the sun rose all combined to make it a very memorable experience. It was one that I have meant to re-create ever since but for one reason or another – mostly weather related – I was unable to do so. The good weather over the last few days gave me an opportunity to consider another trip into the mountains to mark Midsummer. This time however I ruled out Carrauntoohill because of a forecast of thick cloud over Kerry on the night of 19th/20th June, my window of opportunity. 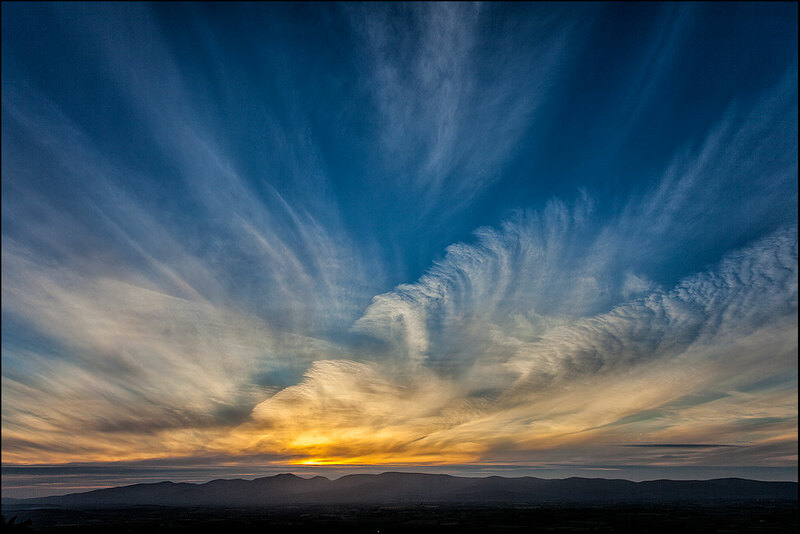 So I chose someplace nearer home – the Knockmealdown Mountains north of Lismore, County Waterford. The forecast suggested that there would be good clear spells and the Moon was 88% full. 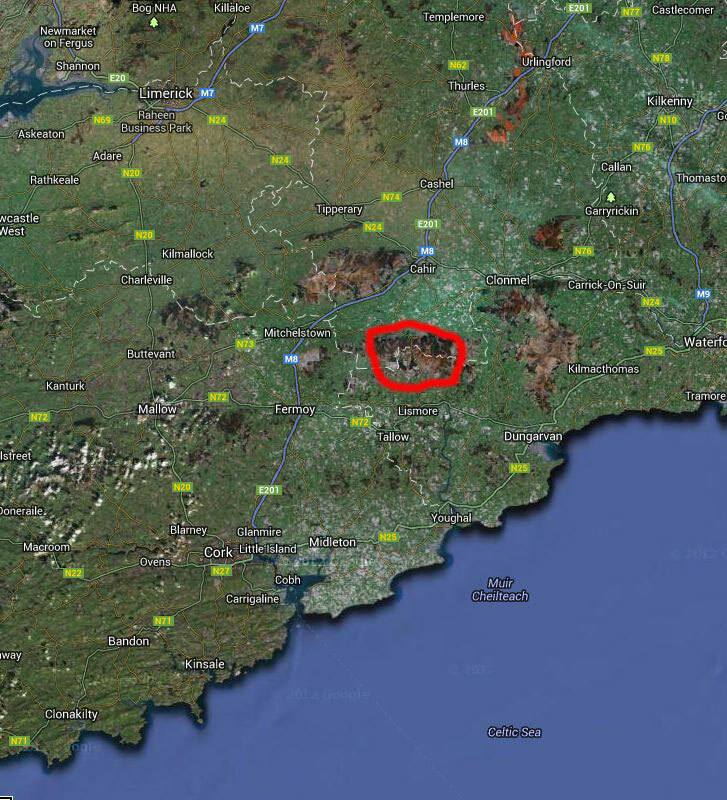 I am very familiar with the Knockmealdowns. Knockmealdown, the highest mountain in the range at 794 metres (2,605 feet), was the first mountain I ever climbed and it has a special place in my affections ever since. The standard route is from the carpark at the Vee Gap up to the Sugarloaf Hill and thence via the ridge to Knockmealdown. The remains of a Famine-period wall mark the route so there is no possibility of getting lost even in poor visibility. I started the ascent to Sugarloaf around 10:30pm. It was bright enough to negotiate the path without the need to switch on my head-torch. My pair of walking poles helped to give me extra momentum on the climb. 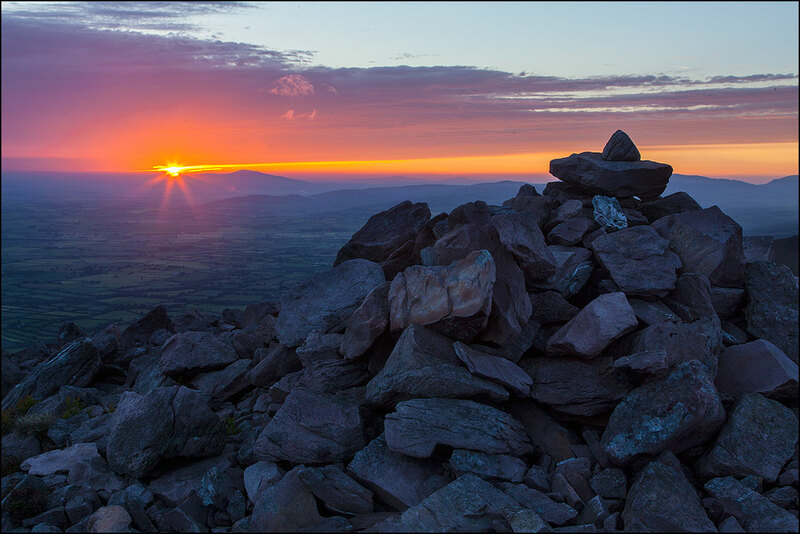 There are a few stone cairns on the summit of Sugarloaf and I rested here for awhile and admired the views – to the North-West the Galtee range, the lush farmland of the Golden Vale in front of me and to the East, Slievenaman and the Comeraghs. It was dark now and the lights of the villages and towns were flickering in the distance – I picked out the ones I recognised: Clogheen, Ardfinnan, Clonmel, Cahir -and North-West of the Galtees, the glow of Limerick City shone into the sky. And while it was dark there was still a glow of sunlight in the Northern sky and it never disappeared throughout the night. It shifted from the North-West, where the Sun had set, across to the North-East from which direction the Sun rose shortly after 5am. 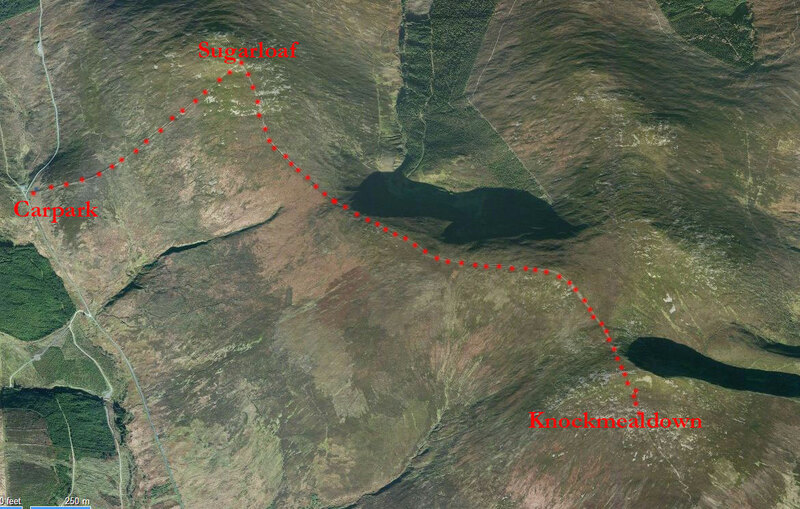 I then started to make my way down from Sugarloaf to the ridge that would take me to Knockmealown. Even with the almost full Moon shining down on me it wasn’t bright enough to walk without artificial light so I switched on my Petzl head-torch which provided superb illumination. As I walked along, the light reflected off the eyes of the occasional sheep resulting in two bright green orbs staring out of the darkness at me every now and then. I arrived at the summit of Knockmealdown around 1 am. Conditions were good- there was only a gentle breeze and the slight chill was remedied by putting on an extra jacket. There was a wonderful silence which was punctuated every now and then by the bleating of a sheep, the barking of a dog in a farm far below or the sound of an occasional car or motorbike making its way over the Vee Pass. I sat and took in the magnificent view. 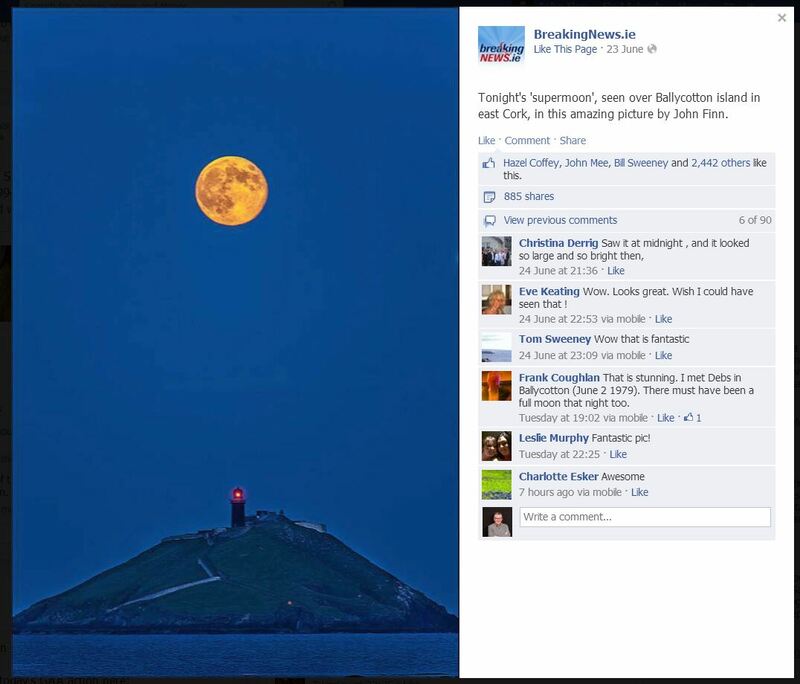 Due South I could see the lights of Youghal and a little to the West of it the red flashing light of Ballycotton Lighthouse. Further along I could make out the Whitegate Oil Refinery and then the glow in the sky from the lights of Cork City. Directly below me were the lights of Lismore and further East, Cappoquin. I took some long-exposure photographs (about 3 mins 30 seconds per exposure at 400 ISO) to pass the time and I used my head-torch to illuminate the foreground. The only point of interest in the foreground was the concrete triangulation pillar used by the Ordnance Survey. Knockmealdown is devoid of any stone cairns and is thus well named – the original Irish name was Cnoc Meal Donn: the bald, bare mountain. I was carrying a lightweight tripod with me which was not very sturdy and which did not have much height. I was very restricted therefore in relation to photographic composition. It would have been nice to have had my usual heavy Manfrotto tripod but there was no way I was going to carry that up the mountains. I should add that photography was very much secondary in my reasons for doing the trip. My primary purpose was simply to do something out of the ordinary, something suitably eccentric, a piece of Midsummer Madness to mark the Solstice. 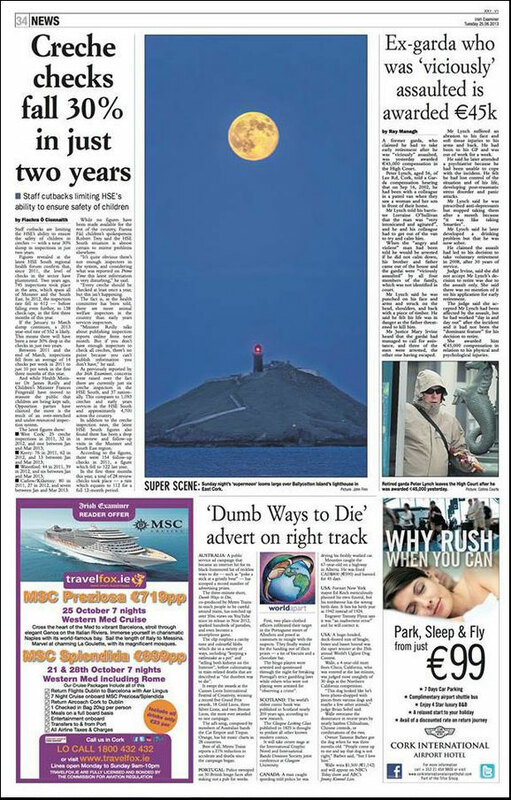 It is strange that we don’t have any festival in Ireland or Britain to mark Midsummer. One would have thought that there would have been an ancient pagan celebration long since Christianised as is the case with Christmas, Easter and so forth, but no. This then was my attempt to mark such a significant time of the year by stepping out of everyday normality for a few hours. And it is good for us, I think, to do that every now and then. The sociologist Robert McIver has written that “the healthy being craves an occasional wildness, a jolt from normality, a sharpening of the edge of appetite, his own little festival of Saturnalia, a brief excursion from his way of life”. I certainly felt the better for it as if some ancient pagan impulse had been satisfied. The lights on the horizon on the right are Youghal. 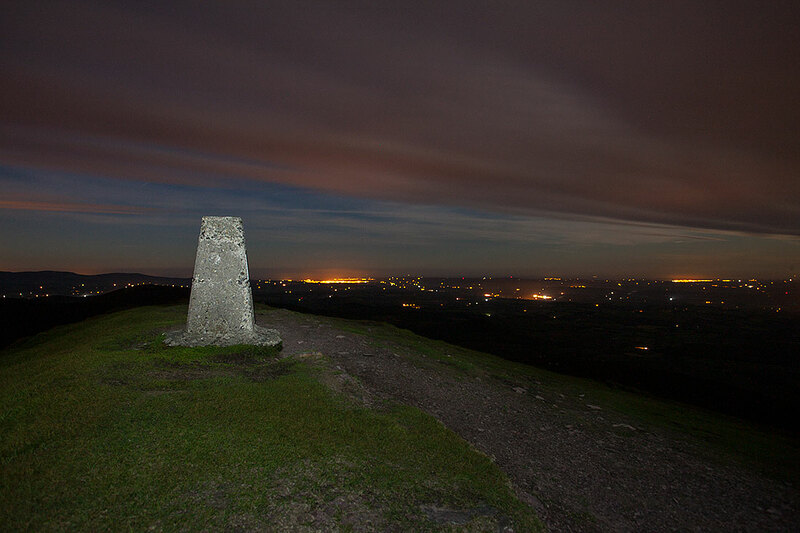 Next to the trig-point are the lights of Cappoquin. 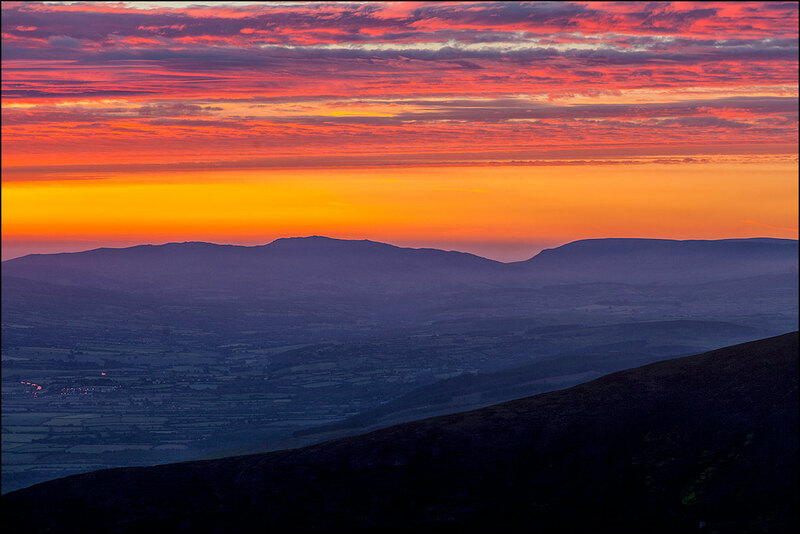 My original intention was to stay on the summit of Knockmealdown until sunrise. That was still several hours away however and I had more or less had enough of the views at this stage. A bivy-bag (a small lightweight shelter) would have been nice to crawl into for a hour or two but I might have fallen asleep and maybe missed the dawn. Increasing cloud from the West also caused me concern. It looked as if it might spread to the East and obscure the rising Sun. All things considered, I decided to head back along the ridge to the Sugarloaf where, if there was a good sunrise, the stone cairns would provide a nicer photographic foreground than the concrete pillar on Knockmealdown. I left the summit at around 3am. The glow in the sky to the North-East was perceptibly increasing in intensity and one could easily make out the outlines of the nearby mountains. This was what is called Nautical Dawn – when there is just enough light on the horizon to distinguish some objects – as against Civil Dawn – when there is enough light for outdoor activities to commence – which began at 4:24. 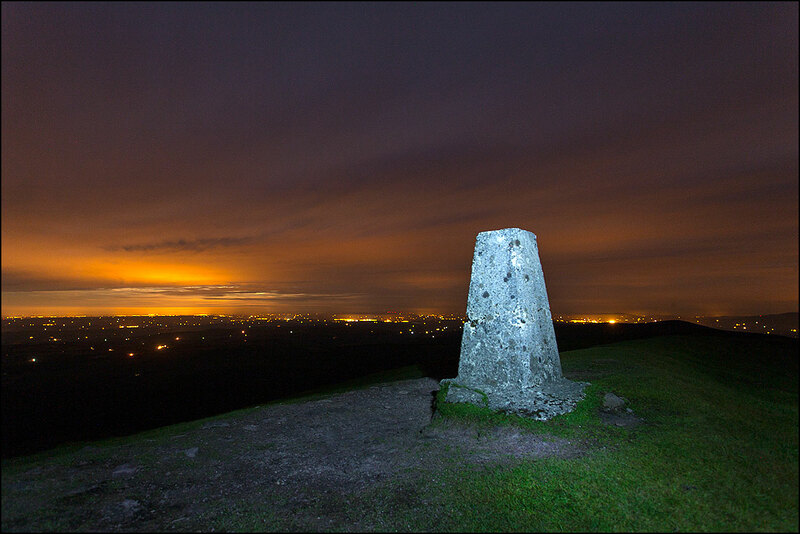 When I arrived back at the summit of Sugarloaf it was bright enough to dispense with the head-torch. I was glad to see a sliver of clear sky where the Sun was due to rise and I prayed that it would remain cloud-free. I set up the camera in front of a cairn and pointed it towards Slievenaman. 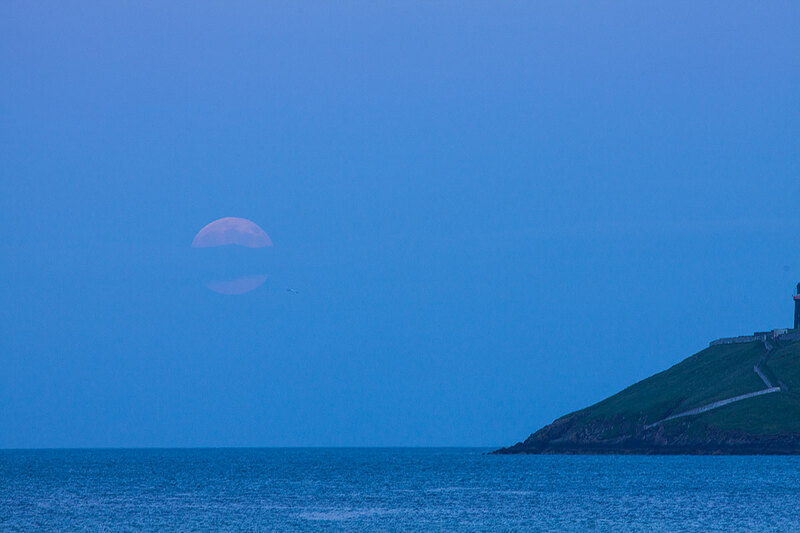 And at 5:04 am it rose and shone with magnificent splendour for about a minute and then disappeared into cloud. I felt blessed at having seen it. It was a fitting culmination to a wonderful night. I have since been asked by a couple of people about practical advice regarding venturing into the mountains at night. Probably the best advice is: don’t. Hillwalking can be risky enough in broad daylight; at night the risks are increased. Even with the best torch visibility is decreased and it can be difficult at times to judge the height and distance of rocks and other obstacles. Also, the impact of lack of sleep – even for the most chronic insomniac – while doing strenuous walking and scrambling can result in impaired judgment and the possibility of an accident. But if you are still really determined to do it make sure you have a good head-torch. The one I use is manufactured by Petzl and they make the best. An ordinary torch is not recommended because (a) it might fall out of your hands and break on a rock and (b) your hands should be holding walking poles, another indispensable item of equipment for night walking, in my view. 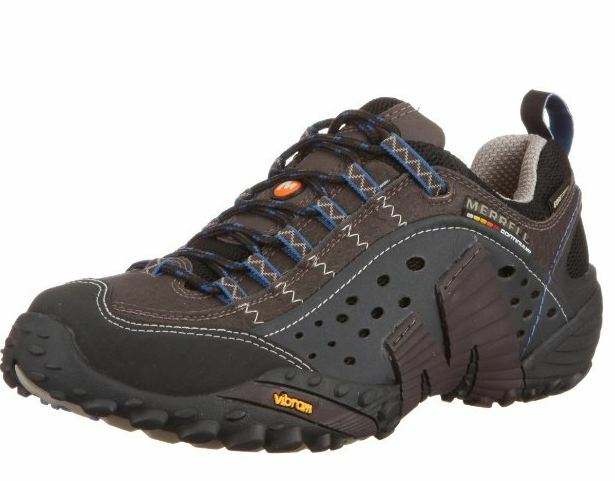 Not only do they provide added momentum on the ascent they help to keep you safe when descending by maintaining your balance and supporting you if you are in danger of tripping or falling. Pick a mountain (or mountains) that you are familiar with and a route that you have done several times before. Be prepared for a sudden deterioration in weather (this is Ireland, after all). Would you be able to find your way back if fog or mist came down? Can you navigate your way out of trouble? A hand-held GPS unit is ideal in that you can plot your route with waymarks and then it’s just a matter of retracing your steps if visibility deteriorates. There are a few smartphone apps that do the same thing but the problem with smartphones is battery life. The very time you might need it the power might be gone. A portable shelter like a small tent or a bivy-bag would also be very useful not only if bad weather comes down but for whiling away the hours until dawn. Needless to say, you should carry good warm clothing and an additional layer in your backpack for when you stop for any length of time en-route. When you have finished the walk and are back at your car the temptation is to get home as quickly as possible in order to catch up with lost sleep. This can be lethal. There is a very real danger of nodding off at the wheel for a second or two. That’s all it takes to get killed. It is far better to snooze in the car for an hour or so before setting off. Drinking a can of Red Bull, I have found, is also beneficial for staying awake. I don’t know if the effect is physiological or psychological but it doesn’t matter – it works for me. I also find that taking off my shoes and driving in my stockinged feed helps me to stay alert (a tip that was given to me by a long-distance lorry driver years ago). I suppose I should also add you shouldn’t do it alone – all the standard mountain walking advice says you should walk with at least one other person for safety. Maybe so but I think a night walk such as I have described above demands to be done solo in order to savour the full experience, the sense of something like the numinous that being alone at night on a mountain can impart. The chatter of another person – or worse still, other people – can dilute that feeling. Yes, it is risky going up alone but by God it is worth it! 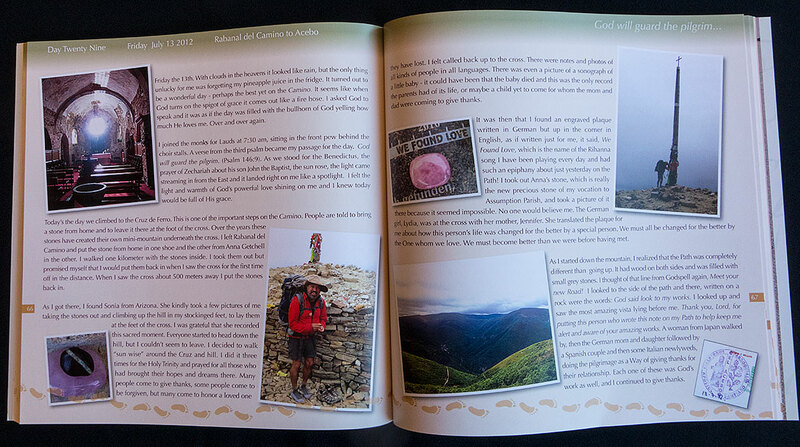 I had been thinking about doing a section of the Camino de Santiago for the last year or so. A friend of mine, Rita Scannell, did most of the forty-day Camino de Francés last year – from St.Jean Pied de Port in the Pyrenees to Santiago de Compostella, the terminal point for all the Camino routes. Reading about her progress on Facebook prompted me to give a portion of the walk a try and I had early 2014 in mind. The following week I attended a First Communion ceremony in Dennehy’s Cross Church in Cork City. I spotted an item on the noticeboard in the doorway: “Next Thursday, A Talk on the Camino by David Clifford in the Church Crypt”. The coincidences were piling up! I came to the conclusion that I was meant to do the Camino. It was definitely in my future. There were too many signs for me to ignore it. The talk by David Clifford made up my mind. He has done the Camino several times and by different routes. Last year he did the Via de la Plata, the 1,000km trek from Seville which takes 6 to 7 weeks to complete. His excellent slide presentation of photos taken en-route and useful advice as regards how much and what to carry etc., led me to decide there and then to do it, and to do it this year, not next. When I got home I booked the flights (Dublin/Santiago) for September and a hotel in Santiago for the last two nights. I don’t have forty days to spare for it though and so I’m just doing a short section, the 115 km stretch from Sarria to Santiago. I’ll be away for just a week and will be walking for 5 days with the average daily walk taking about 6 hours. Very much a Camino-lite then in contrast to Rita’s and David’s full-on treks. Maybe next year. And I’m walking on my own which is also recommended. Experts such as David say you should avoid walking in a group at all costs – the fast walkers will be annoyed at having to slow down to let the slower ones keep up and the slow ones will feel under pressure to keep pace. Besides, part of the attraction of the Camino is meeting other people and walking a part of the road with them as they tell their stories. 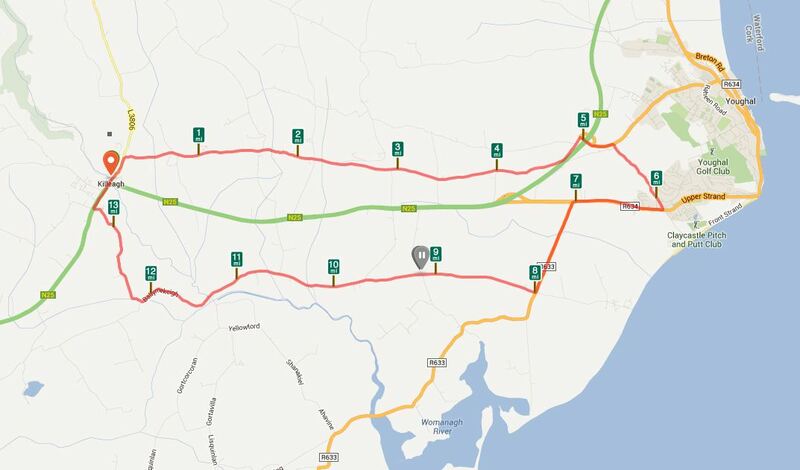 Photos from the RunKeeper app of two favourite routes of mine – one from Killeagh to Youghal and back and the other around my home place of Carrigtwohill. Both avoid busy main roads for the most part. There is a wealth of information on the web about the Camino. 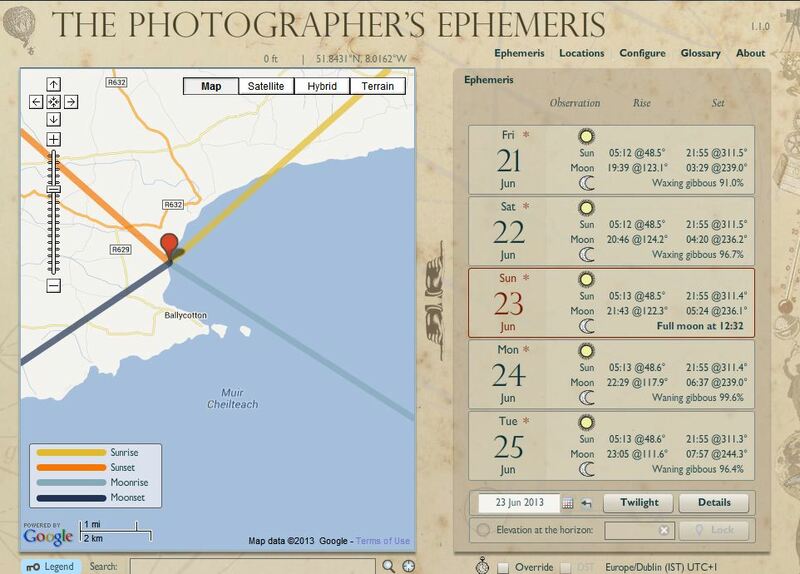 David Clifford recommended two sites in particular: http://www.mundicamino.com/ingles and http://www.godesalco.com/plan (for downloading the route to a smartphone). 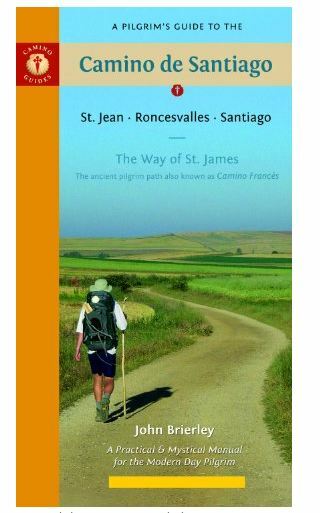 The guidebook for the Camino de Francés that everyone recommends is John Brierley’s “A Pilgrim’s Guide to the Camino de Santiago” and it is easy to see why – it is packed with helpful information for every stage of the walk. 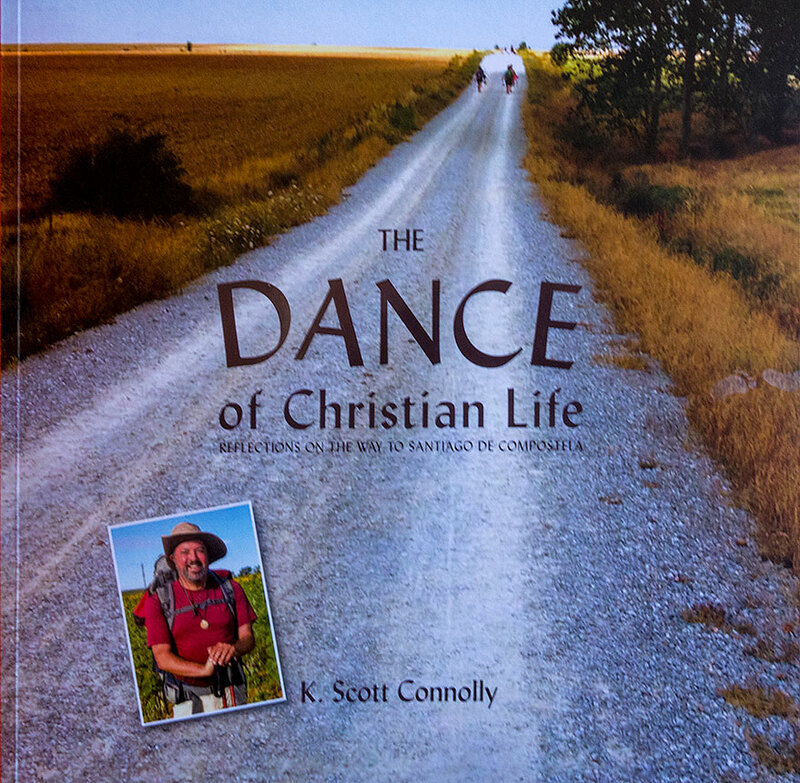 Another book just published is “The Dance of Christian Life – Reflections on the way to Santiago de Compostella” by Scott Connolly. Scott is a Catholic priest in the Archdiocese of Seattle and in 2012 he did the full forty-day Camino de Francés. He kept a journal each day and took numerous photos with his iPhone. He was convinced by Rita – who he met on the way – and others to publish his journal and photos as a book and it is a sumptuous publication. It was designed by Rita and printed by Watermans of Cork. As the title suggests, it is informed by a deep religious belief – he is a priest after all! – but it will be of interest to anyone who either has done or is thinking of doing the walk. It is full of interesting and funny anecdotes. He set out each day with a carefully chosen scriptural verse to inspire him but also used the music of Rhianna, Madonna and Jennifer Lopez to put a pep in his step! The cover of Scott’s book – check out that cool hat! Scott’s purpose in doing the Camino was a specifically spiritual one – to renew his vocation to the priesthood and to his vocation as Pastor of the parish he serves. Why am I doing it? I’m simply looking forward to the challenge – such as it is (I’m already feeling a certain regret that I didn’t sign up for a longer walk) – and of trekking in the beautiful Galician countryside. I’m looking forward to meeting other pilgrims on the way and of listening to their stories. 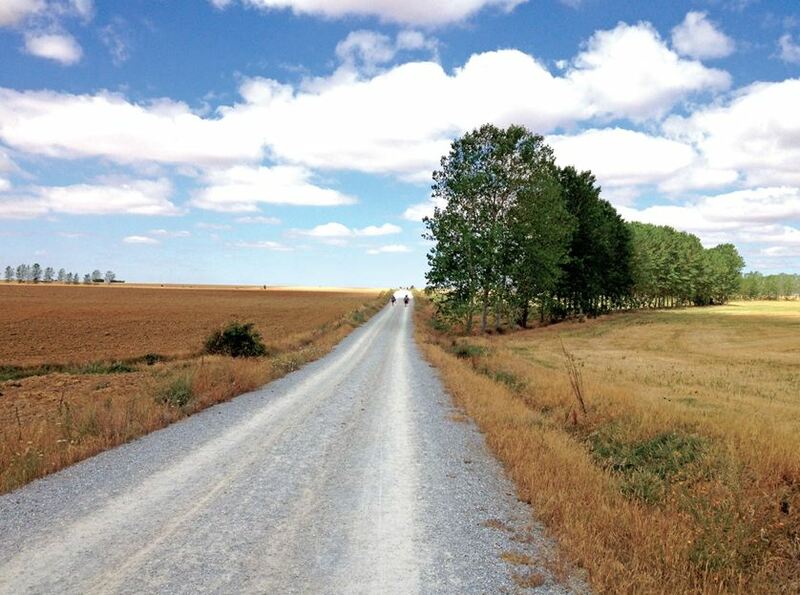 I like the fact that the Camino is more than just a long-distance walk. It is primarily a pilgrim route and has been for hundreds of years. I like the fact that something that should be an anachronism in the modern age is increasing in popularity every year. This isn’t evidence of some religious resurgence of course – people of every religious persuasion and none do it – but it does betoken, I think, something beyond the mere long-distance physical challenge. John Brierley in his book urges readers to find a spiritual purpose for taking the journey, whatever form that spirituality may take. David Creedon talked about the different mental mode he finds himself in, how after a week or two he finds himself living fully in the now and how liberating that is. Alas, my short week is unlikely to result in such enlightenment but I have every confidence nonetheless that I will find it a richly rewarding experience in ways that will probably surprise me. I’ve been a member of http://www.Audible.co.uk – the audiobook company now owned by Amazon – for four years. My monthly subscription of £7.99 entitles me to one credit which lets me download one book a month. If I wanted to I could purchase additional books but I’ve found that the monthly credit is sufficient. When I first joined one could only download the audiobooks to an iPod but latterly this facility has been extended to smartphones, tablets and other MP3 players as well. This is a great advantage as it reduces the need to carry two devices when out walking – which is when I usually listen to them. Time was when I listened to music when walking but now it is almost exclusively books. One can also listen to them in the car – most recent cars have an “aux” channel on the radio console which, with the addition of a cheap cable readily available in any electronics store, allows the audible content to be broadcast. If your car doesn’t have such a facility you can purchase a battery powered device that will let you stream the audio content through an unused FM frequency. They cost about €20 and are well worth it. Obviously you could listen to your MP3 player/phone via earphones while driving but I’m not sure if it’s safe or legal to do so. Besides, it looks odd. There is nothing like an interesting book to shorten a long walk or journey. Much as I love radio there are times when I want to escape from the unremitting gloom of the news, the opposing voices of the latest Great Debate, the talk-radio moaners and whiners and the inanities of the music DJs. A good book is a blessed relief from all that. I don’t think I’ve ever downloaded a book that I didn’t finish. I check the reviews on sites such as Amazon as well as those on Audible itself and so far I haven’t been disappointed. The quality of narration is very important of course – a poor narration can impede the enjoyment of an otherwise excellent book – but I’ve never come across a narrator that I did not like. You can listen to a sample of each book’s narration before purchasing and decide if you could live with that voice for the duration. Some books benefit from being narrated rather than read as the characters come to life in a way that they might not when one is imaging how they speak. Hilary Mantel’s “Bring Up The Bodies” is a case in point – the narration by Simon Vance is masterly. The different characters’ voices are unique and memorable and add hugely to the enjoyment of the novel. You are transported to the Tudor court in a way not possible through a conventional reading. 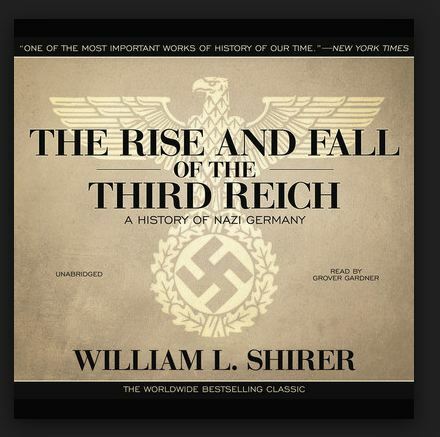 The longest book I’ve listened to is William L. Shirer’s “The Rise and Fall of the Third Reich” which is 57 hours and 13 minutes long. It is a riveting history and one that has stood the test of time well (it was originally published in 1960). It took me about two months to complete. Other memorable books include Walter Isaacson’s biography of Steve Jobs, Keith Richards’ “Life”, “The Popes” by John Julius Norwich, “Fatherland” by Robert Harris, Le Carré’s “Smiley’s People” and David Mitchell’s “The Thousand Autumns of Jacob de Zoet”. 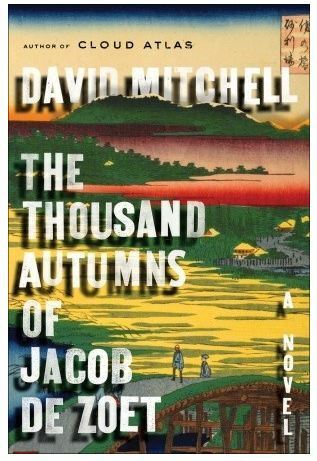 Mitchell’s book is one of my favourite novels – I had already read it twice and the audiobook, beautifully narrated by Jonathan Aris and Paula Wilcox, further enhanced my enjoyment of it. It is a wonderful read in any format. More recently I have greatly enjoyed “The Fry Chronicles” narrated by Stephen Fry himself and likewise the comedian David Mitchell’s “Back Story” also read by the author (who is not to be confused with the novelist). 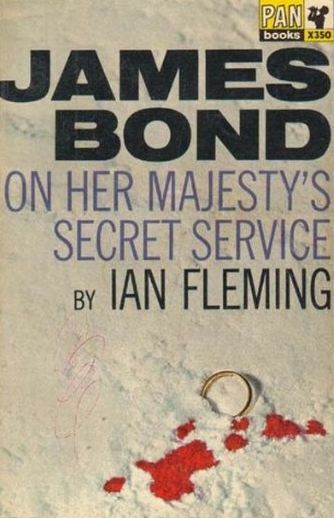 I have just finished Ian Fleming’s “On Her Majesty’s Secret Service” narrated by David Tennant. I was wary about downloading a James Bond book. I had read them all when I was twelve and thirteen and I was a devoted fan. I remember my sister getting me “From Russia With Love” from England because while it was not (as far as I know) officially banned in Ireland (this was 1964/65) it was not available in the local bookshop or library either because of its racy content. The whiff of notoriety surrounding it only served to whet my adolescent appetite of course. And it was a tremendous read (and one of the best Bond films). But that was a long time ago. Were the books really as good as I thought they were then? Would I be disappointed in them now with nearly a lifetime of reading behind me? I’m glad to say I enjoyed it enormously. David Tennant is a brilliant narrator and Ian Fleming was an excellent writer. His books are much more interesting than the films – hearing Bond’s thoughts fleshes out the story in a way that a film can never do. “OHMSS” kept me keenly interested throughout even though I knew how it ended (and what a devastating end it was). 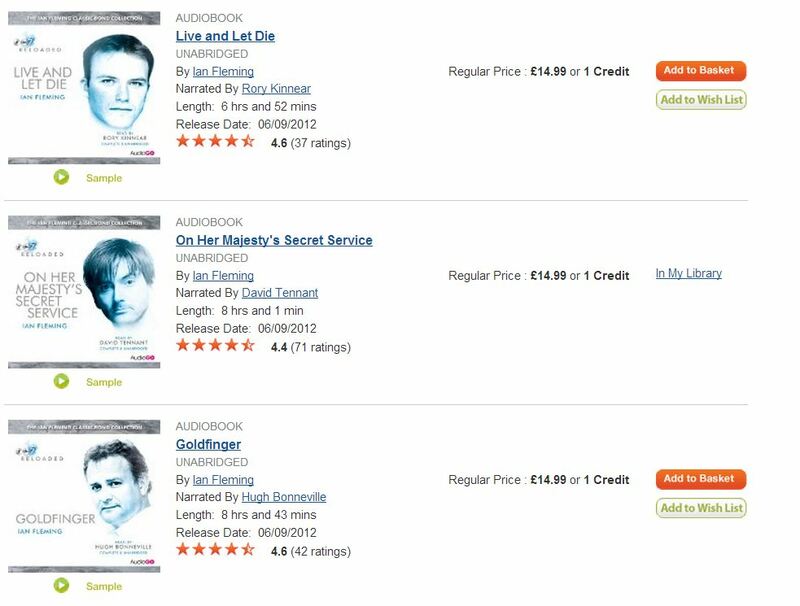 All the other Bond books are available on Audible and they are narrated by actors such as Kenneth Branagh, Damian Lewis, Hugh Bonneville, Rory Kinnear and others. Whoever commissioned the series deserves the gratitude of Bond fans. I shall certainly be re-living my early adolescent Bond obsession over the coming months thanks to Audible. My advice is to forget the films – especially the camp Roger Moore ones – and discover the books for the authentic 007 experience. That said, it is almost impossible for me to imagine anyone other than Sean Connery as Bond. He was the original 007 and the early films – “Dr No”, “From Russia with Love”, “Goldfinger” and “Thunderball” – co-incided more or less with my reading of the books. They were also fairly faithful to the original stories whereas a lot of the later Bond films bore only a passing resemblance to them and recent ones none at all. Ian Fleming wrote 14 Bond books whereas there have been 23 films with more to come. But enough about Bond. There are over 100,000 titles to choose from the Audible catalogue. Audiobooks have come into their own thanks to their compatibility with MP3 players, tablets and smartphones and are ideal for anyone on the move be it for work or leisure. And being actively mobile – walking or driving (I can’t comment on running or cycling as I don’t do either) – I think is integral to the experience. On all other occasions I prefer to read rather than listen. Unlike listening to music, listening to an audiobook requires concentration in the same way that reading a paper book does. I’ve sometimes found my attention wandering and have had to re-wind to get back on track just as I’ve often read paragraphs or even pages of a book and did not take the content in. That concentration, that absorption in the story, takes us out of ourselves and helps us forget about our worries and woes for awhile and is one of the great joys of reading.